The Choice Music Prize live event was on last night in Dublin. I heard some of the event on Tom Dunne’s Pet Sounds show on Today FM. This Irish music award was established last year and is considered to be the Irish equivalent of the Mercury Music Prize in Britain. Last year it was won by Julie Feeney for her album 13 Songs. The award is for the best Irish album of 2006. Republic Of Loose - Aaagh! 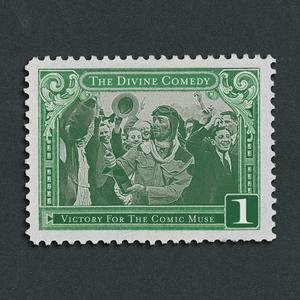 Last night the prize was won by the Divine Comedy for their latest album Victory for the Comic Muse. This was somewhat of a surprise win as Duke Special had been tipped to win. Neil Hannon was literally speechless when the winner was announced. As usual Betty, on the cutting edge of things! # posted by Pure Cork Boy : March 01, 2007 2:40 p.m.
# posted by Betty the Sheep : March 01, 2007 4:02 p.m.
Don't know about him being speechless but by the state of him he looked nearly legless! # posted by GammaGoblin : March 02, 2007 3:39 p.m.